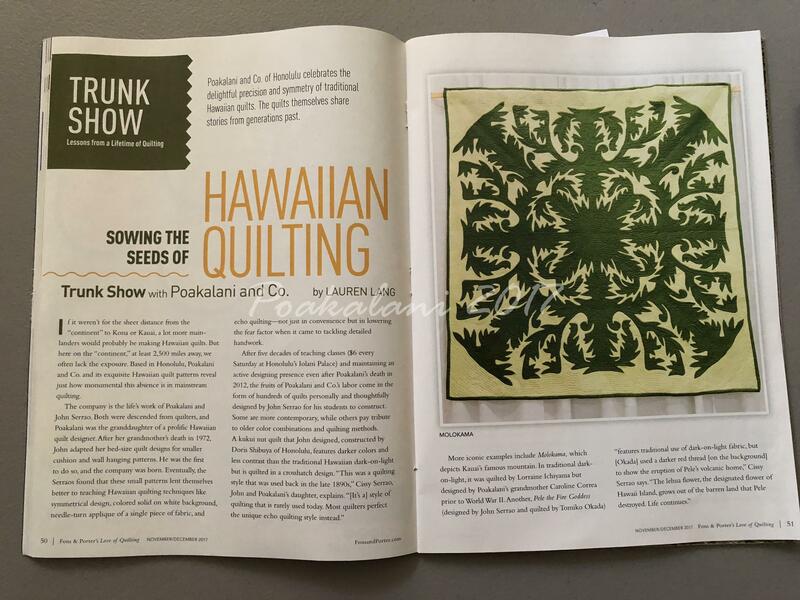 News & Updates Archives - Page 2 of 3 - Hawaiian Quilting With Poakalani & Co.
It’s official we’re back again at the Honolulu Festival 2018. 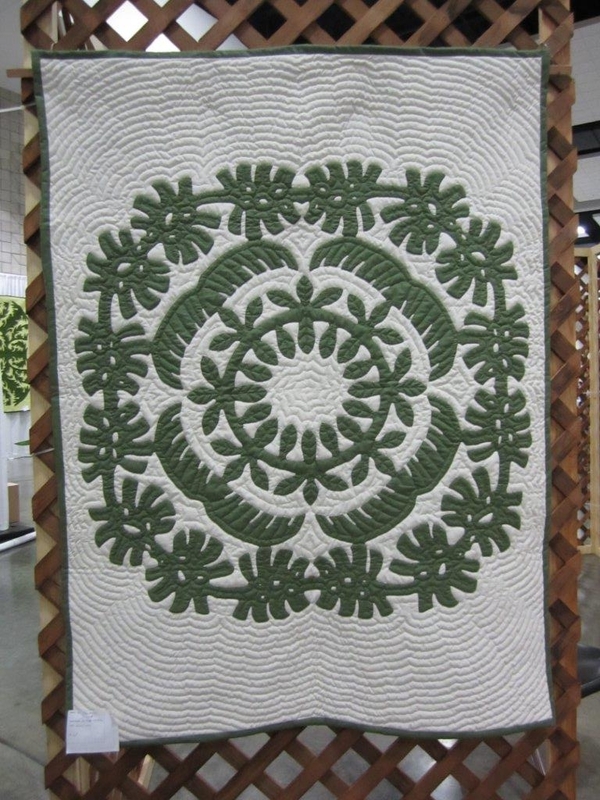 We’re excited to display quilts made by the members of the Poakalani Quilting Family. It’s going to be another amazing show. So mark your calendar and visit us at the festival. Food, cultural displays and entertainment. 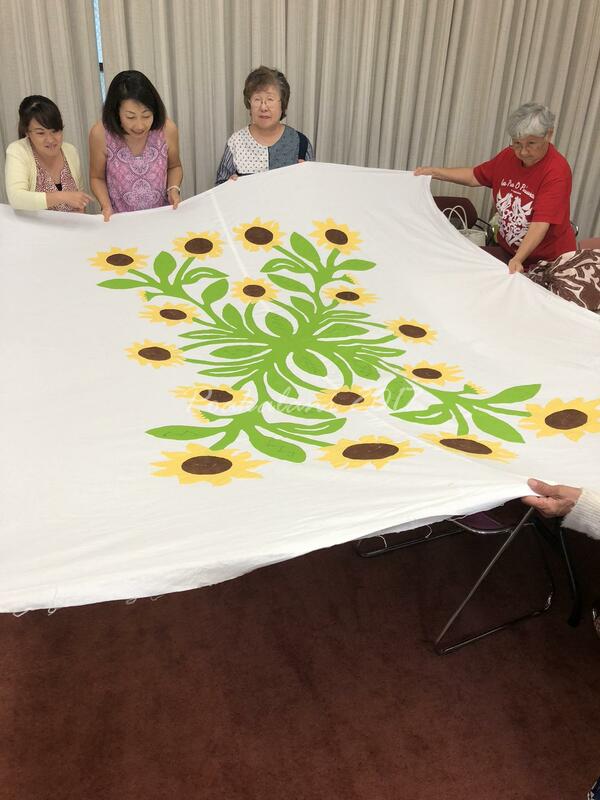 Until then enjoy this amazing quilt by one of the students of Naomi who teaches in Kobe. 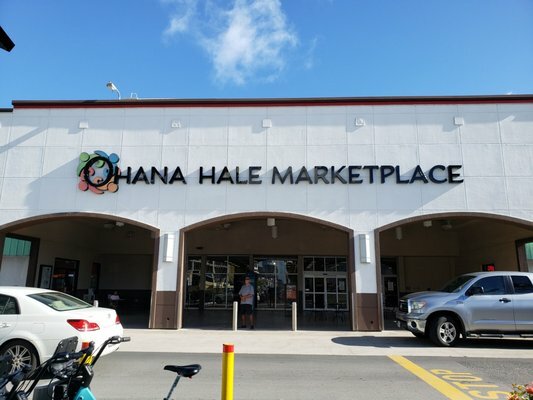 Great job student and Kumu Naomi. …we will see everyone back on November 25. 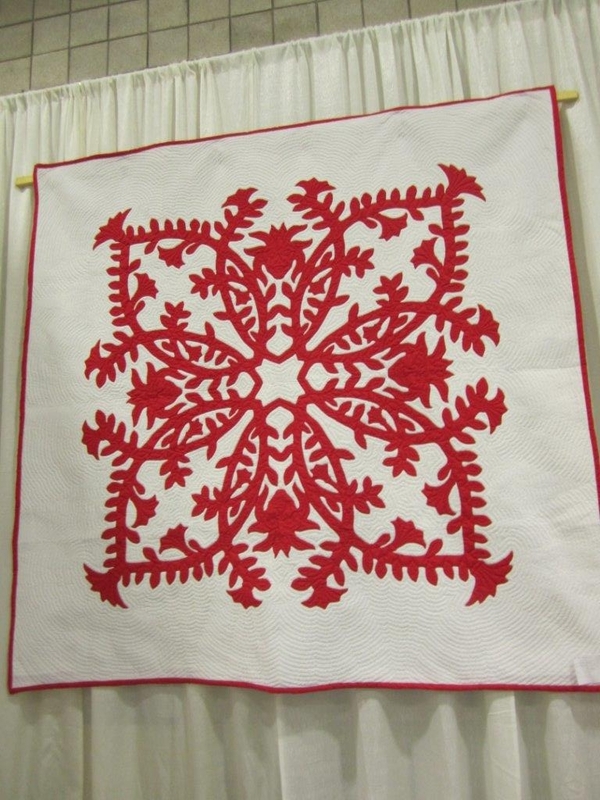 In the meantime enjoy a few quilts from our past Saturday class. Great ladies and beautiful projects in progress and on their way to becoming heirloom masterpieces. 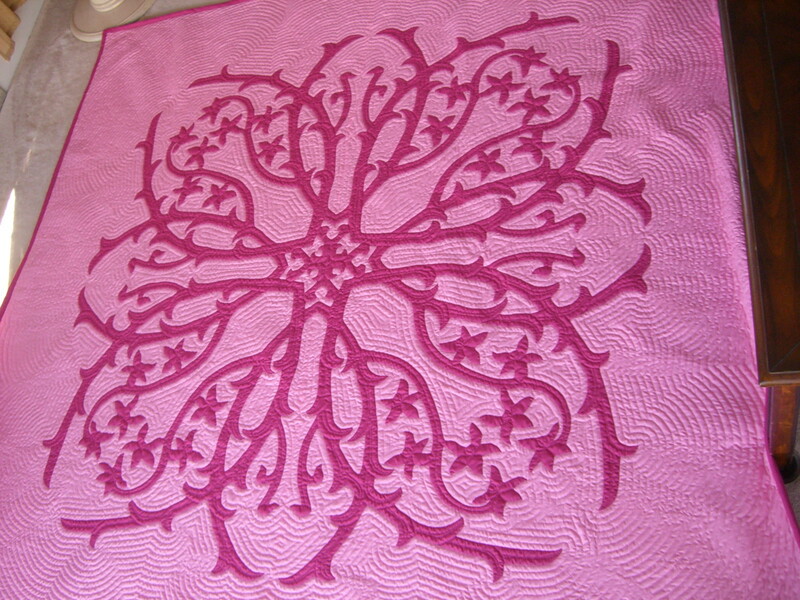 Pat finished another commission quilt. Beautiful Hydrangea. Just needs the binding. Another John Design. 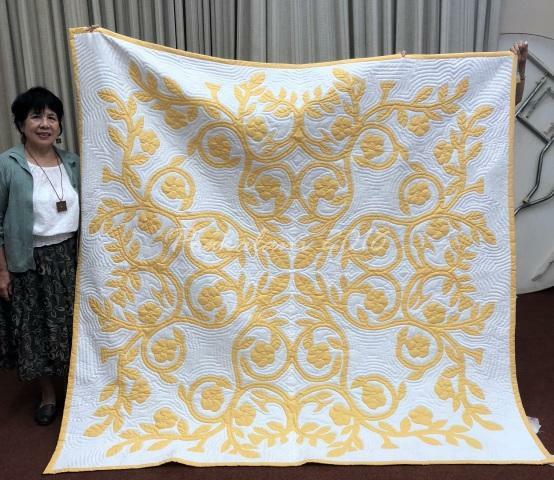 Last time we saw Takako’s quilt it was just basted. 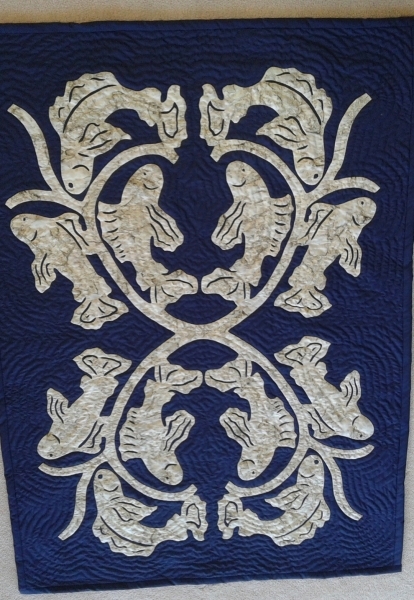 Now it’s completely appliqued and ready for quilting. What a happy quilt. 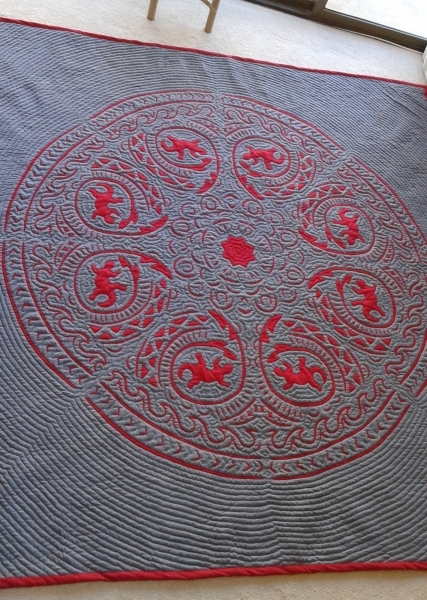 Anne-Marie’s Monsterra quilt. 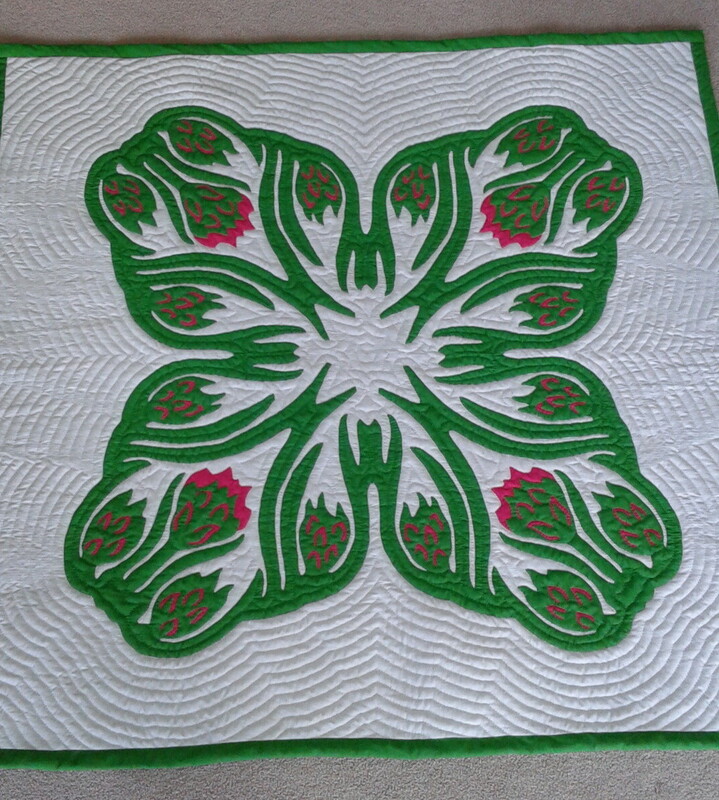 With of the help of her ladies she was able to lay out the quilt this past Saturday. Another personal design by John. Wow. Jen’s first full size quilt. Cherokee Rose and Cherry Blossoms. Cut, laid and now ready for basting. Another John personal design. Safe Travels Jen see you in December. 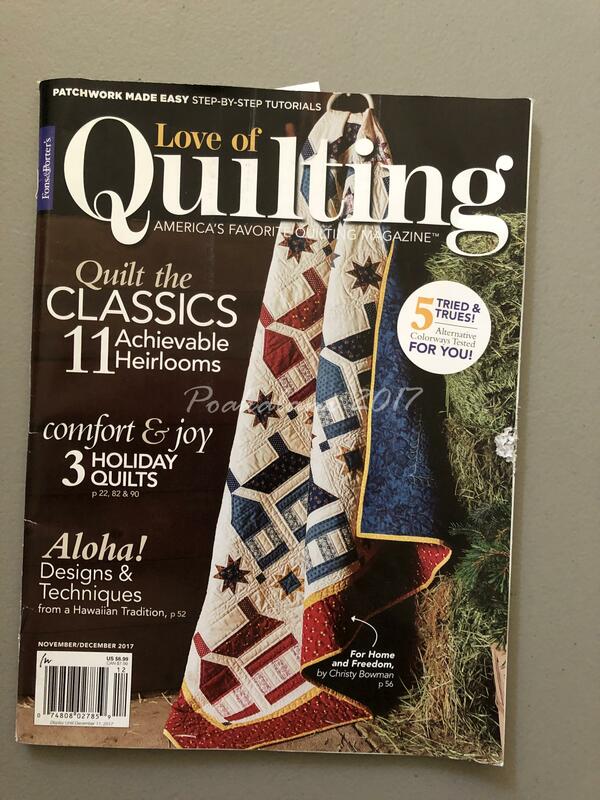 Thank you Lauren for the amazing article in the November/December issue of “Love of Quilting” magazine. 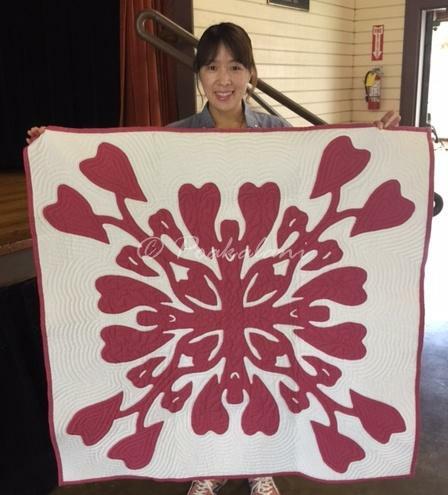 Thank you for showcasing our amazing quilters. 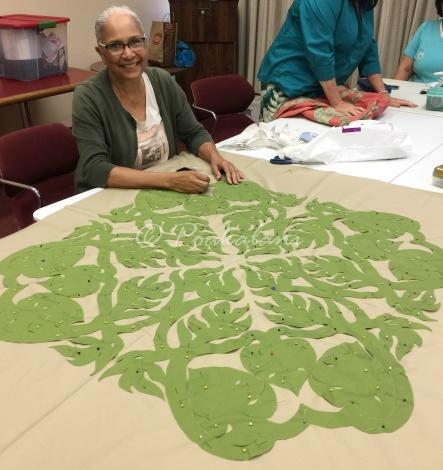 They’re the best cultural keepers of Hawaiian Quilting and so are you. 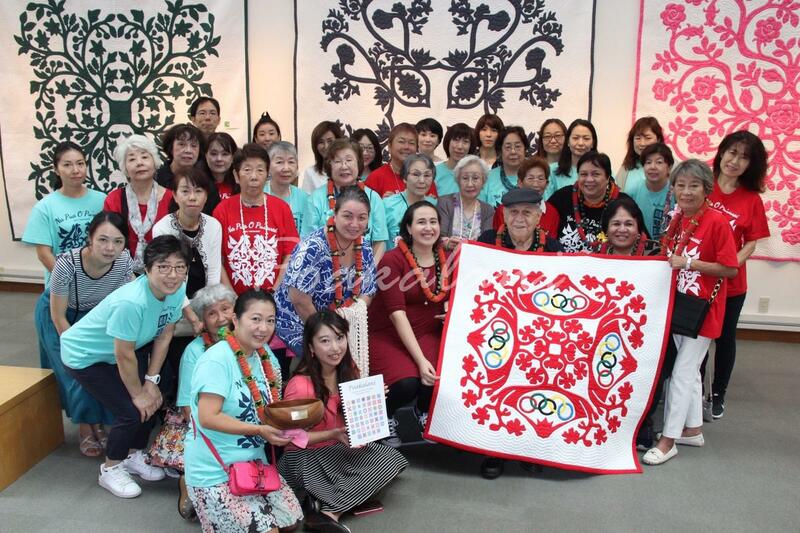 Real Proud of our family of quilters on Oahu and in Japan for one of the best Hawaiian Quilt Exhibits. 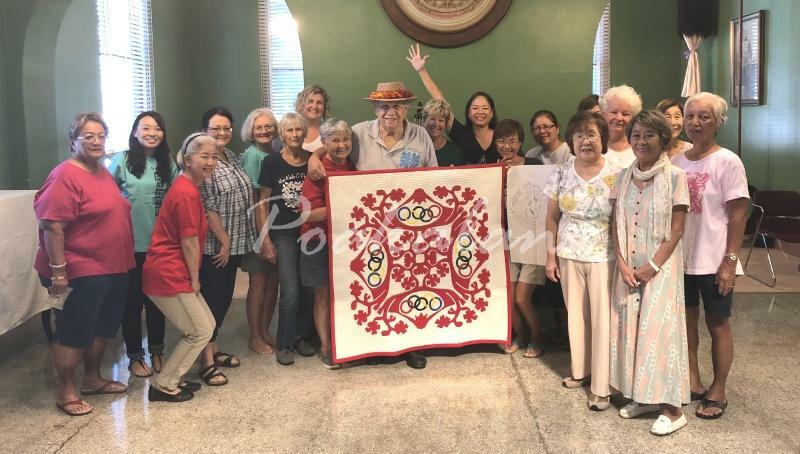 Thank you for taking care of us in Yokohama and thank you for your gift of aloha the “Olympic Quilt.” Cut and basted in Japan, appliqued on Oahu and returned and quilted in Japan. 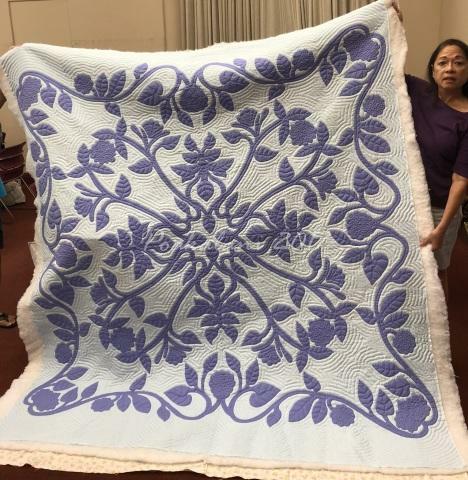 It was an amazing surprise for John and the quilt is beautiful. 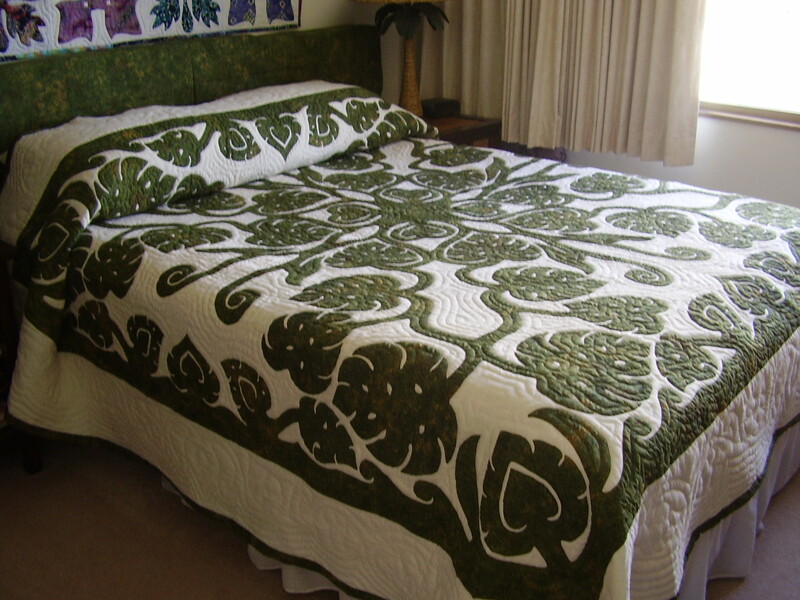 But most of all thank you for quilting the Traditional Hawaiian Way. Share it with the world so it will continue on. We ♥ all of you. 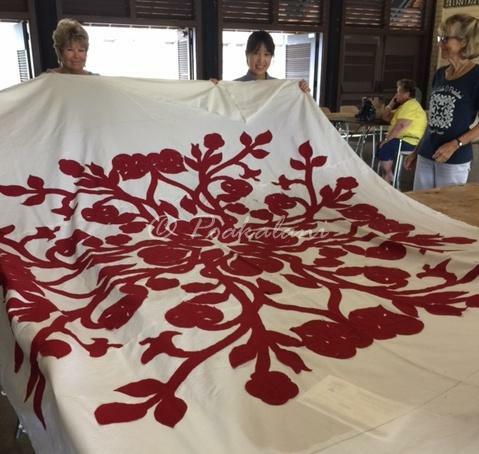 ” Na Pua O Pu’u Wai” Flowers of The Heart Hawaiian Quilt Exhibit”. 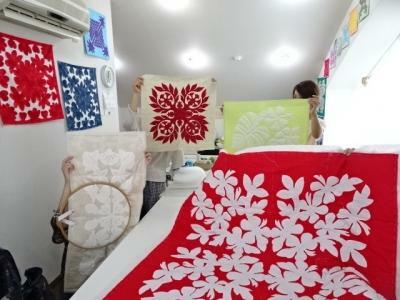 47 Prefecture Flower Design Quilts and more… lots more. It’s going to be amazing. 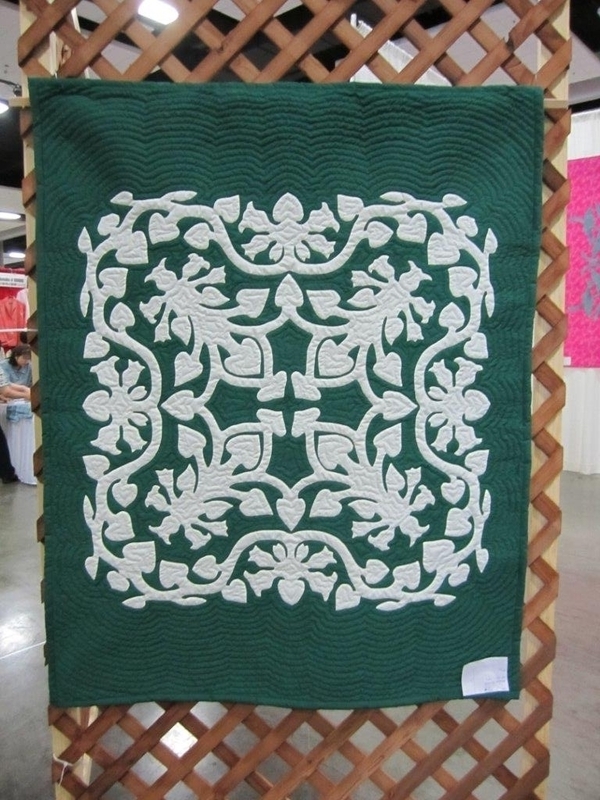 Our certified instructors and some of their students will displaying “NEW” quilts. 3 Generations of Quilters. 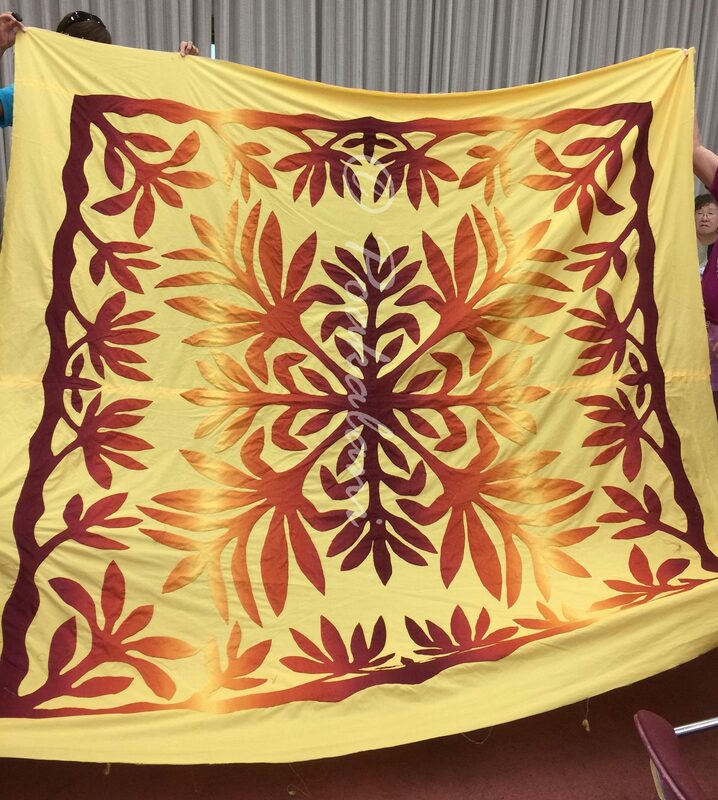 Master Quilter Kupuna John, His students and now their students… We’re so proud. NO Class September 9. We’ll be back on September 16. Design First, News & Updates Comments Off on NO Class September 9. We’ll be back on September 16. The amazing designs of Kumu Tomoko. 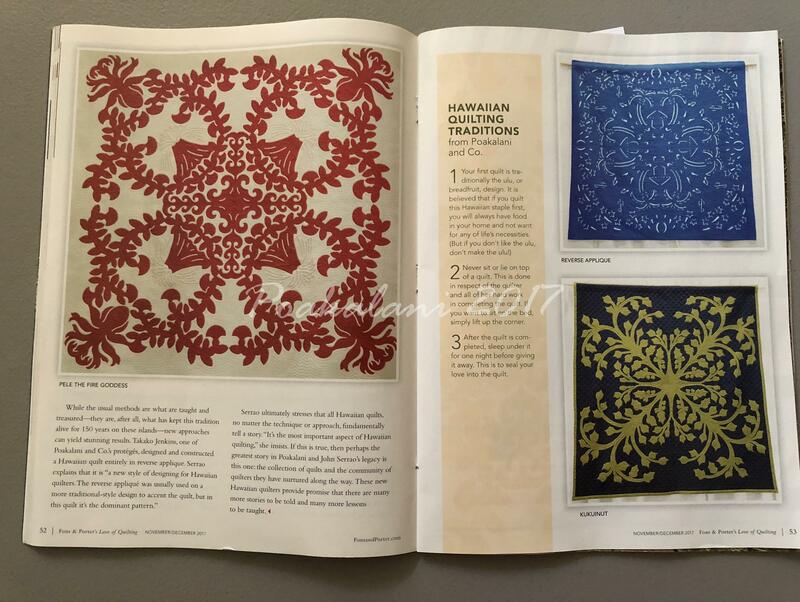 My heart dances when I see Hawaiian quilting being taught around the world. 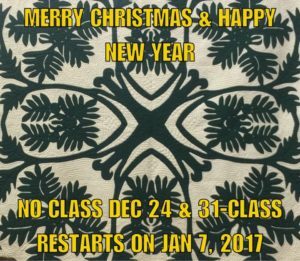 It’s been a busy year so again sad to say there will be no class on August 5 and we’ll see everyone back on August 12. 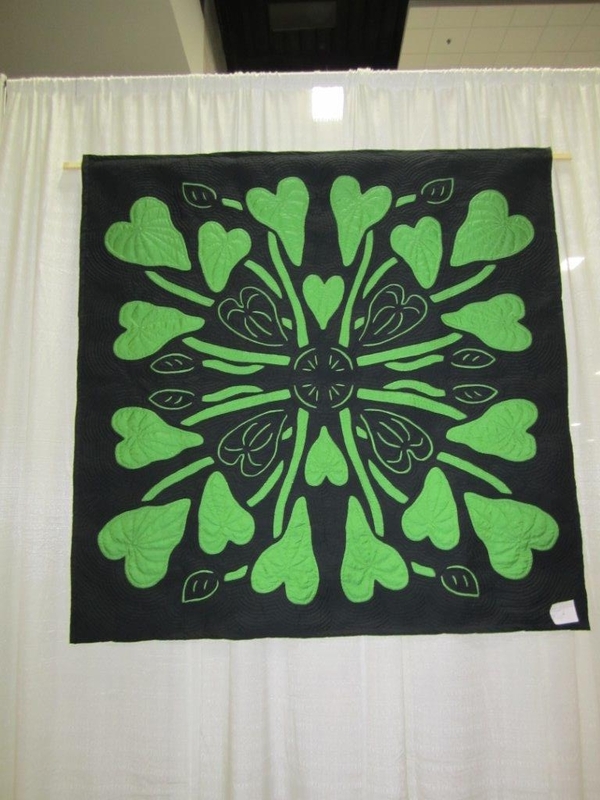 But I’ll leave you with this amazing applique by Susan. 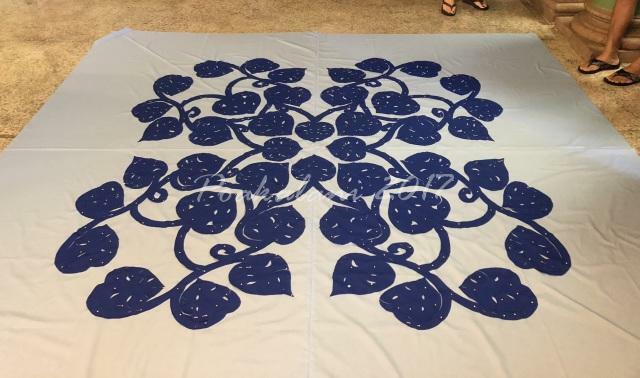 Ti Leaf design with a floating lei ready to be quilted. NO Class June 10, Kamehameha Day Parade. 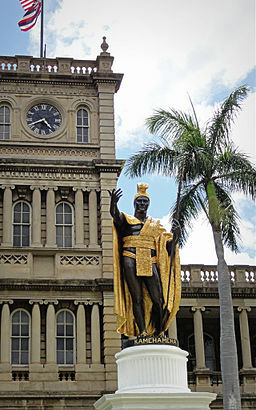 A day to celebrate our Hawaiian”ness” in parades, Fairs and fun. Everyone have a great day and see all of you on June 17, 2017 for our Summer Potluck…. 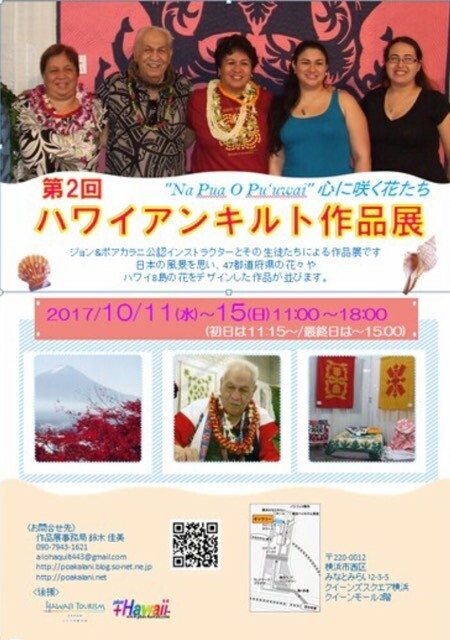 Remember to join the party bring an “ono” dish to share. Starts promptly at 10:00 “ish”. 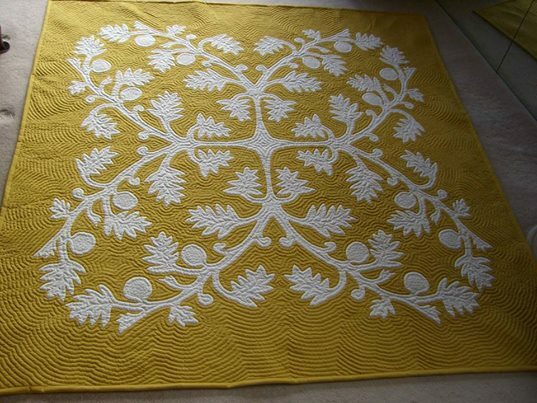 …in the meantime enjoy this beautiful Monsterra Quilt that John designed for Beth. Her first and hopefully many more. Another personal and wow John Design. We’re back at the Palace this Saturday. 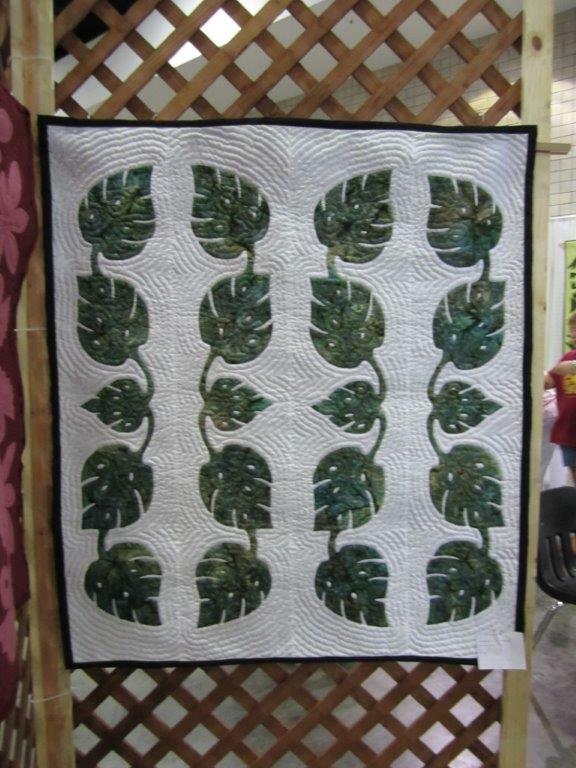 Come and join us for another weekend of Hawaiian Quilting and Congratulations to Rumi who not only finished her Anthurium wall hanging but also laid out and basted her next week. Wow! She’s living her Dream. Sometimes you just have to go with the flow. 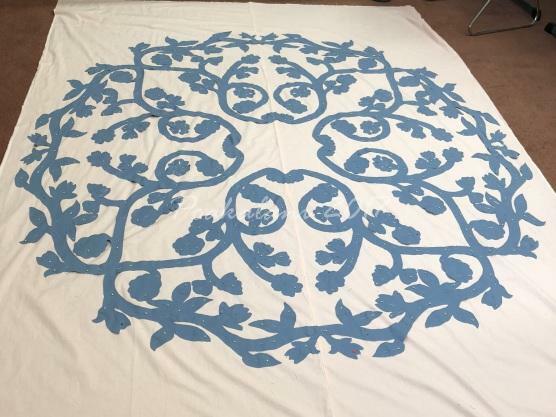 We were scheduled to have a day off from quilting this Saturday March 4 because the room we usually have class in will be used for another palace function. 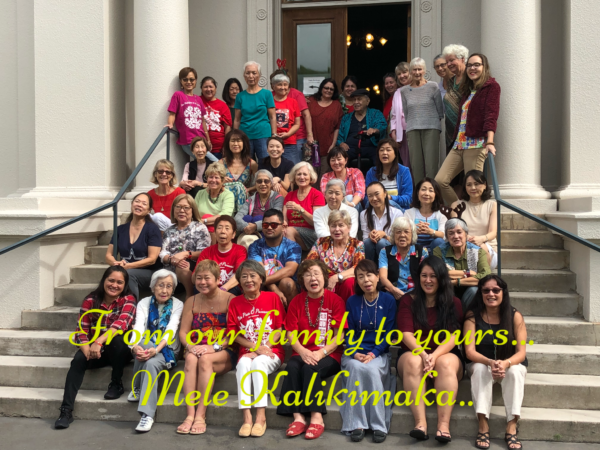 But my day off was short lived when the Bishop Museum called and invited us to have our class there in their Atherton Halau. So ladies we’re having quilting class. 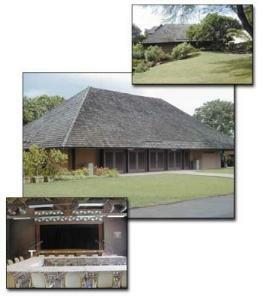 If you haven’t made other plans come and join us at the oldest museum in Hawaii. 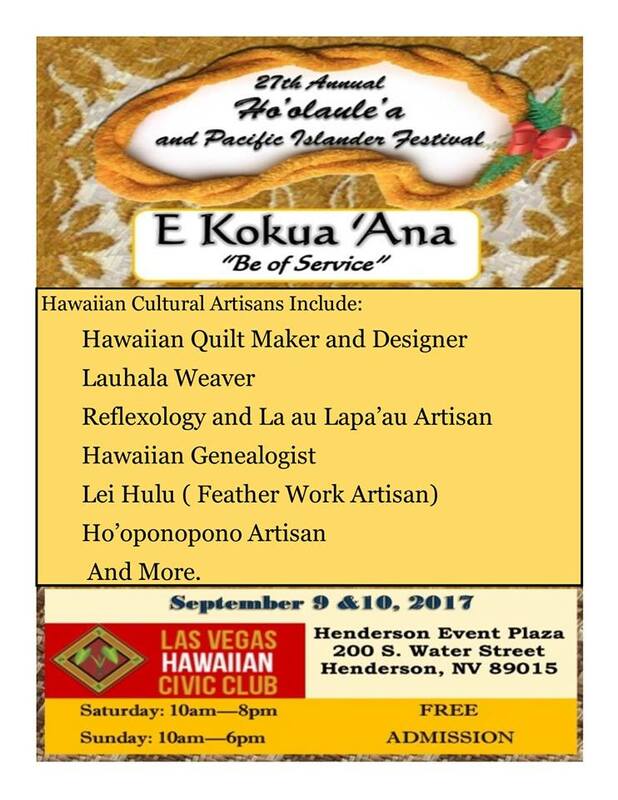 The Atherton Halau is located right outside the Bishop Museums main building near the entrance and gift shop. You will need to pay parking or there’s a lot of street parking just outside the museum grounds. Hope to see all of you there. I hope the ladies who called about class this Saturday will able to come after all. 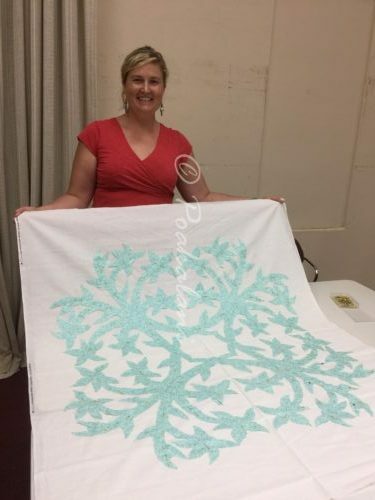 Wishing everyone a Merry Christmas & Happy New Year and for all of our loyal quilters I uploaded to the Poakalani Stores all 50 states and Washington DC 45″ x 45″ State flower wall hanging patterns. They are beautiful. John did some really amazing designs. Stay safe and see you in 2017.